CocktailMom: My $2 buck dinner that feeds 4! Tonight I made a dish that I have never made before; Hominy Corn Chowder. My goal was to make a dish that didn't cost a lot and produced barely any waste and I accomplished it!!! And guess what...it even tasted good! Luckily for me the hominy was "reduced for quick sale" and cost me only 50 cents for the entire bag and the sausage was part of a buy 10 for 10 buck deal at my grocery store. Here is what you need to recreate this inexpensive meal. Soak the hominy in cold water overnight. Drain and rinse. Combine 4 cups of water and the hominy in a large saucepan. Bring to a boil. Reduce heat, cover and simmer for 1 hour. In a medium skillet, cook sausage until browned, drain; set aside. Cook onion and potatoes and celery until tender in a skillet with a tablespoon of oil. 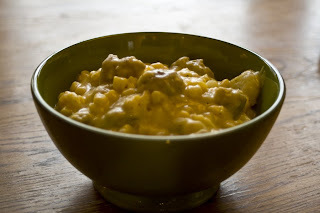 Combine hominy, sausage, onion/potato mixture together. Stir in the bouillon cubes, pepper and the milk. Allow to simmer for 5 minutes more and then add the cheese and continue to stir until cheese is melted. I acutally said to Jen "14 teaspoons of pepper?! That's gotta taste awful!!!" She pointed out that it was probably meant to say a 1/4 teaspoon. I think I'm ready for it to be the weekend. haaahaaa I think I"m ready for the weekend too!